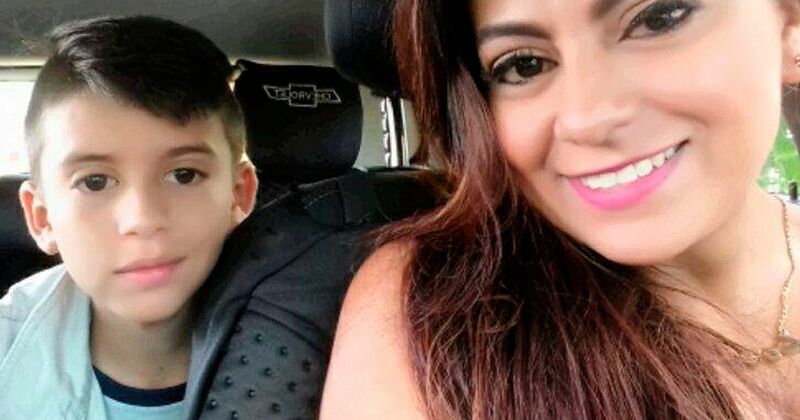 The suicide note left by the desperate mum who jumped from a bridge with her 10-year-old son in her arms has revealed she was being threatened by loan sharks and felt she had "failed" her boy. The woman committed suicide on the La Variante Bridge in the community of Ibague in the central-western Colombian department of Tolima. The woman, identified as 32-year-old Jessy Paola Moreno Cruz, was holding her son May Ceballos on the edge of the bridge while threatening to jump as the emergency services tried to convince her not to do it. However, she ignored their pleas and jumped from the 100-metre (330ft) bridge, killing both of them as seen in the shocking footage. Local media has published Moreno Cruz’s suicide note, where the mother highlighted her economic woes after being evicted from her home and needing to borrow money from dangerous loan sharks with huge interest repayments of between 20 and 40 percent. After they allegedly demanded repayment and threatened the mother, she appears to have decided that suicide was the only way out. She wrote: “I cannot tolerate the idea that somebody could hurt you because of what I did, I prefer that we leave and forget this world. “I have no hope, I have been defeated and humiliated. The man who told me he loved me left me alone, very alone. “They all left me with nothing, everything I worked for, everything I lived for, all I loved, all I gave, it was snatched away in an instant. My mistake was to trust the wrong people. “I failed the person I love most in my life, I cannot afford to pay for his studies, I do not even have enough money to give him hot food. I have placed him in danger and I am sorry for failing you, son. “Every day is more difficult and filled with threats, debt and lack of love. I cannot do it anymore. “There is nobody. The world is dangerous and I cannot protect you. “Every day is grey. My heart beats with anxiety. I cry with frustration and impotence. I am a loser. “This time I will not fail you, my son. Nobody will hurt us anymore”. The two bodies were recovered from the river and their funeral took place that was attended by loved ones and many local residents, according to reports.